When you’re tapped out from cooking the complicated dishes that come along with the holidays, this simple spaghetti with homemade marinara sauce does the trick. It has five ingredients, takes no time to prep, and fills your home with the savory-sweet smell of simmering tomatoes. Pair it with roasted vegetables (or, heck, microwaved peas & carrots) and you’ve got a comforting, complete meal with minimal effort. This is the only way I make red sauce. Serve with your favorite type of pasta. 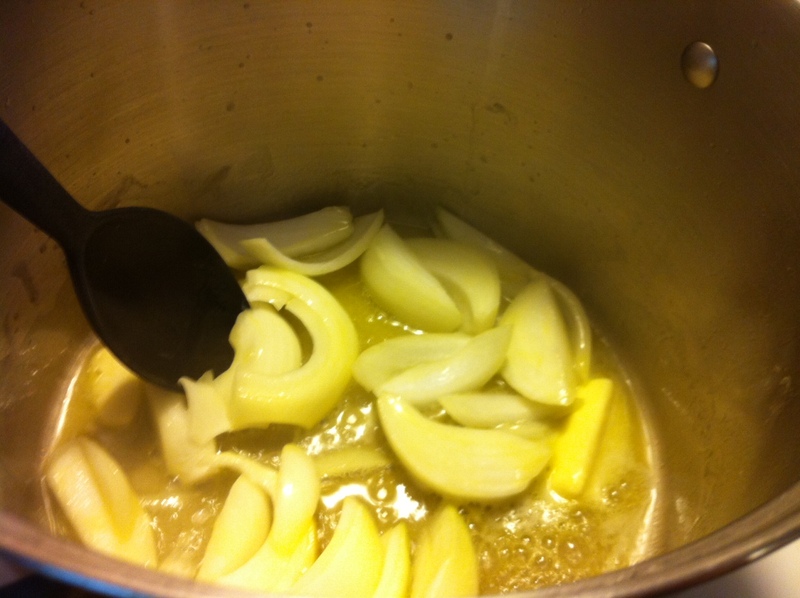 Slice onions thickly and saute in a pot over medium-low with the butter, stirring. 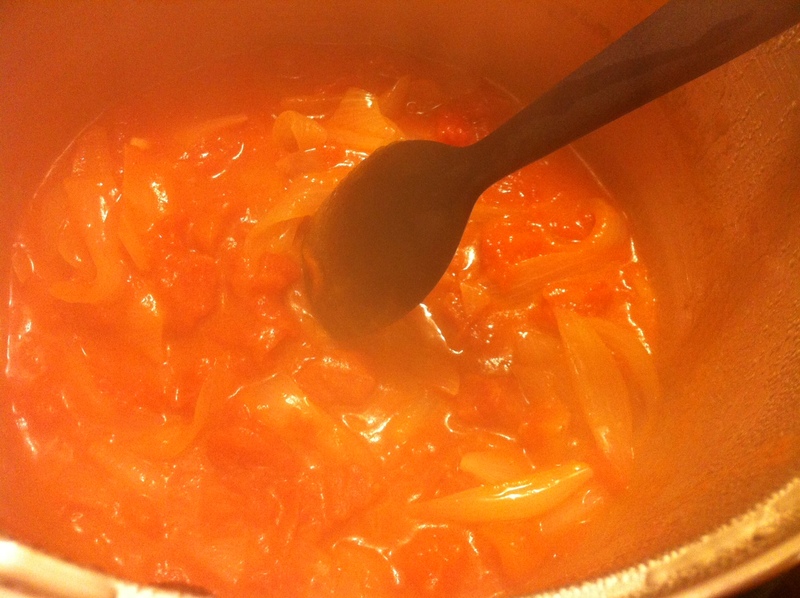 Add the diced tomatoes and cook, stirring, for 5 minutes. Cover and lower the heat; simmer on very low for at least half an hour, longer if you have the time and want the flavors to blend. This is a good dish for a Sunday when you have time to let it simmer (stirring occasionally) for an hour while it mushes up and makes your house smell amazing. By simmering this long, the onions have a chance to turn soft and sweet and that’s what really makes the sauce come together. This recipe easily doubles for a crowd. 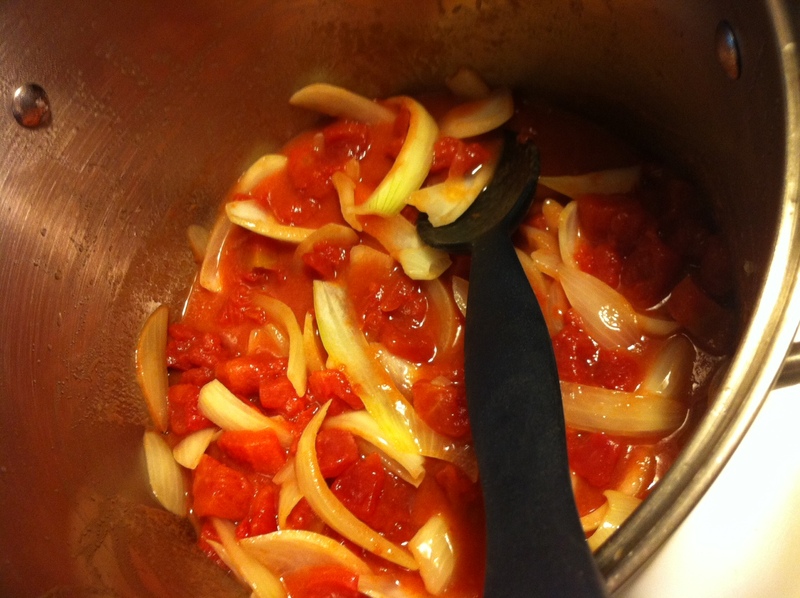 If you’ve got four or more people to feed, use two onions, two large cans of diced tomatoes, and 1 whole stick of butter. 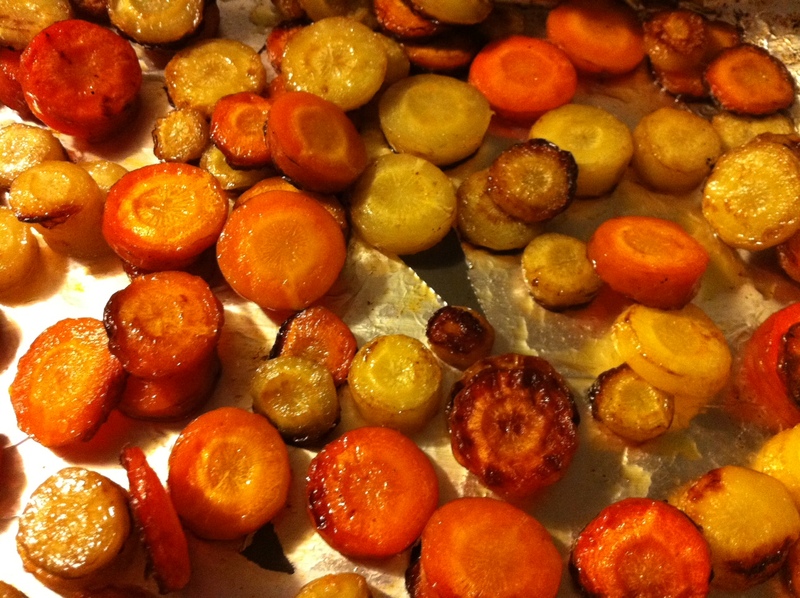 To roast the carrots, simply slice a few into a baking dish lined with foil, and roast in the oven at 400 for 20 minutes or until they’re browned and tender. I like to drizzle mine with honey for the last five minutes of bake time so they get a little bit of glaze to them. Make sure you watch them so that they just caramelize but don’t burn. 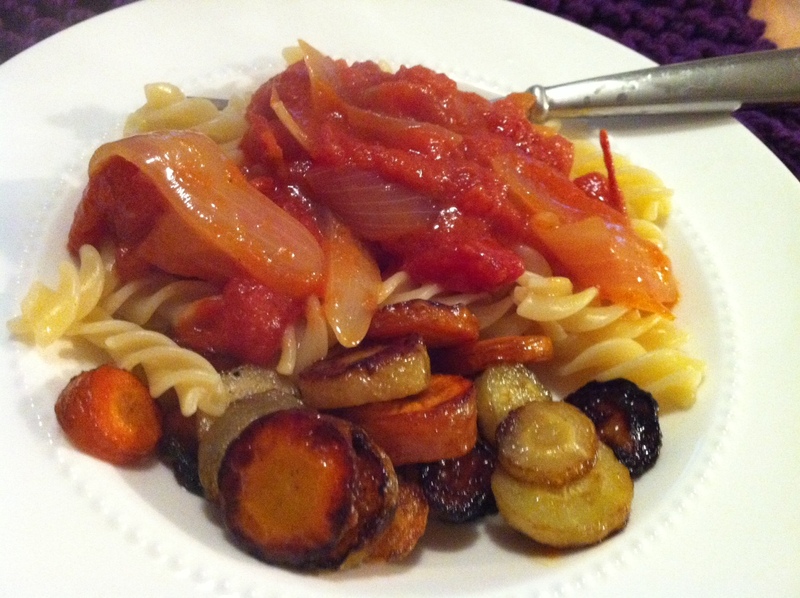 Ladle the sauce on top of your preferred pasta — here I used rotini, because it holds the chunky sauce well — and serve with a side of veggies. 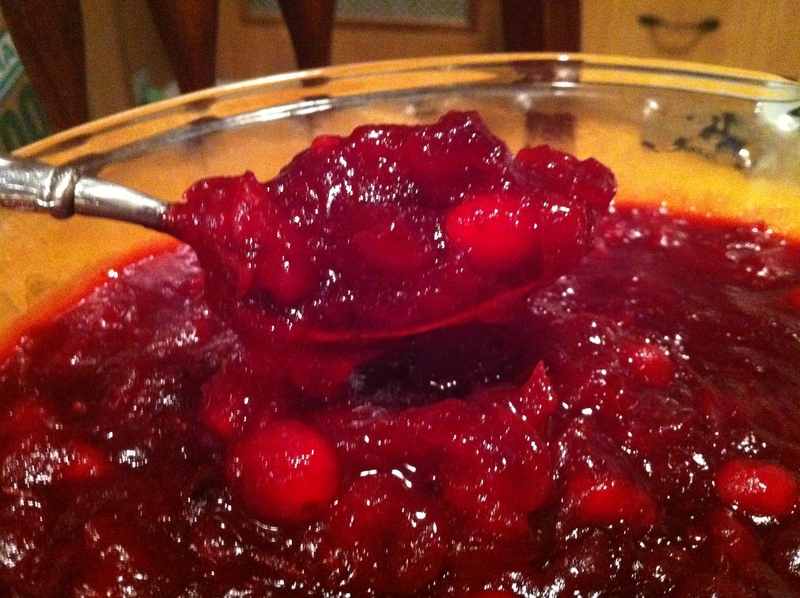 Homemade Cranberry Sauce (with a kick)! It’s such a weird feeling for me to not be cooking the meal this Thanksgiving, but in truth I couldn’t handle it this year. 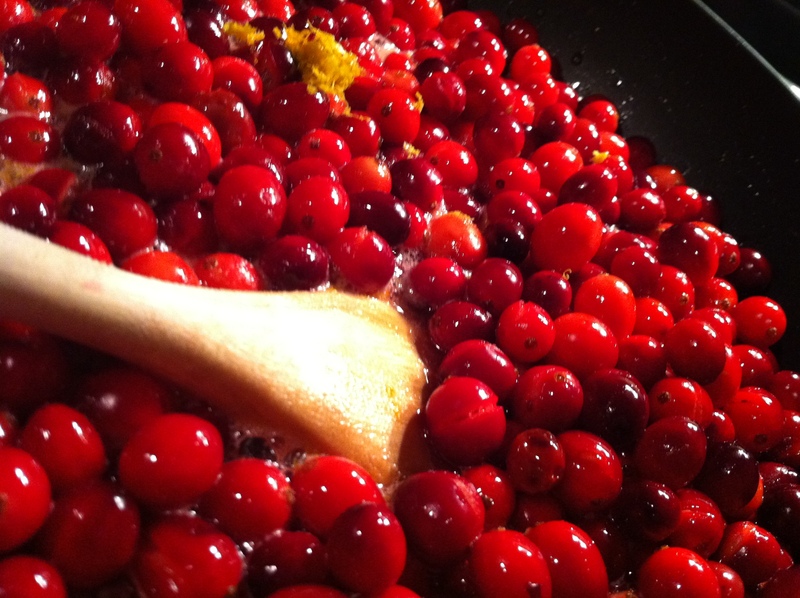 Between 10-hour workdays, a major move, a husband juggling two jobs, and the fact that my recipes and pots are NOT unpacked, I’m lucky I managed to unearth the simple ingredients and saucepan needed to make my favorite side: Cranberry Sauce with a kick! Here is the basic recipe (inspired by one of my first copies of Rachael Ray Magazine, from about 2006). I double this so everyone has plenty to take home with their leftovers. In a medium saucepan, combine 1 cup of water with 1 cup of sugar, 1 cinnamon stick, fresh ginger (or 1/4 tsp ground), orange peel and salt. 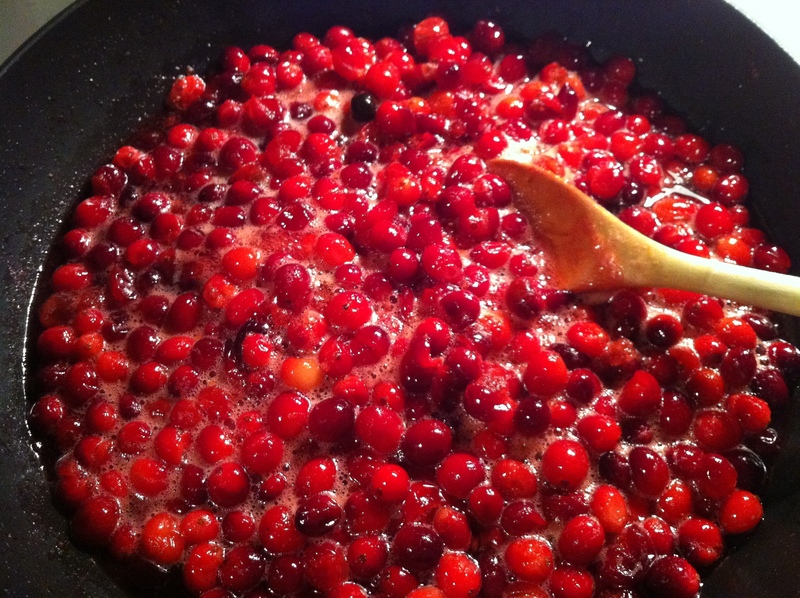 Cook over medium heat, stirring constantly, until the sugar is dissolved. 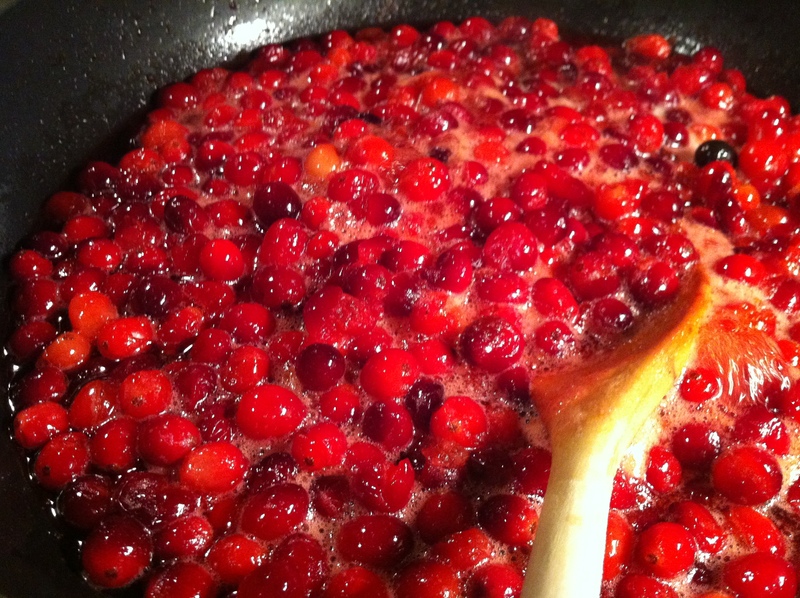 Stir in the cranberries and bring to a boil, then lower the heat and simmer, stirring, until slightly thickened, about 10 minutes. Transfer the mixture to a bowl and remove the cinnamon stick (unless, like me, you let it simmer wayyyy longer than 10 minutes so that the sauce turns gelatinous and the cinnamon sticks practically dissolve). Let cool. Enjoy! And have a very Happy Thanksgiving! It’s taking us a lot longer to get unpacked and settled into our new house than we expected, so I’m posting a collection of recipes from other bloggers I love as inspiration. Who doesn’t need to expand their recipe box anyway? Gnocchi is one of my most-loved Italian dishes (it’s pronounced NYO-kee), and these are just a few variations I’ve been dying to try. And, once I figure out which box my pots and pans are hiding in, I will! This recipe, from steamy kitchen, shows that gnocchi don’t have to those be hard-as-a-rock, boring-as-heck potato dumplings you may have experienced. With a lightness in the mixing, you can avoid the kind of overworked dough that often leads to tough, chewy gnocchi. 1. 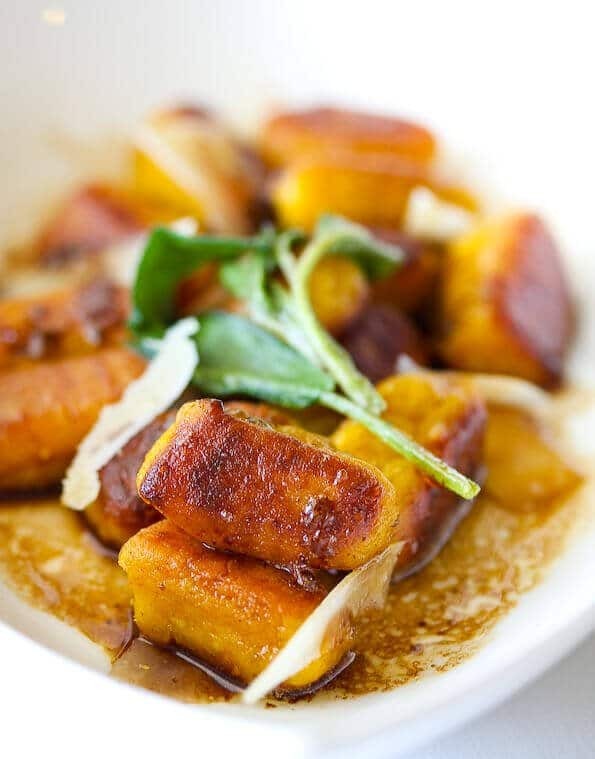 Combine ricotta, pumpkin parmagiano, yolk, zest and salt in large bowl. Mix well. Sprinkle half of the flour on the mixture, gently turn with spatula a few times to incorporate. 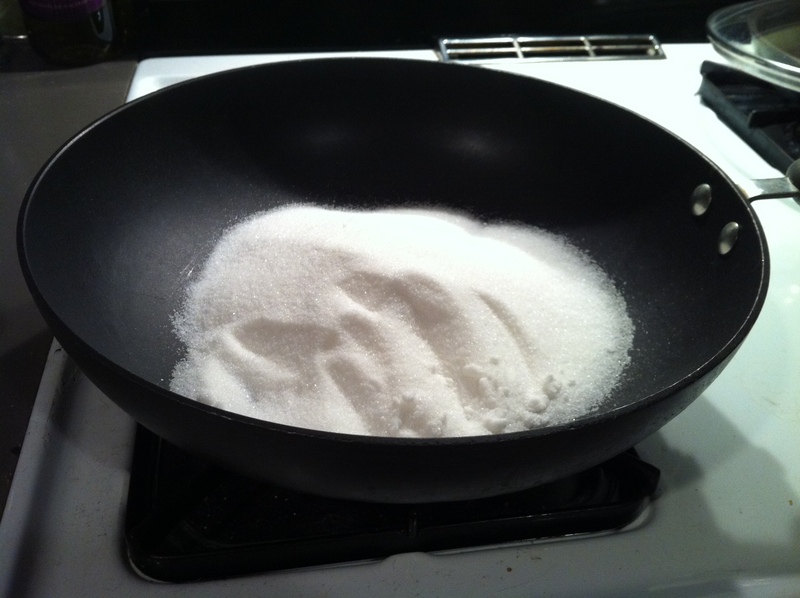 Dump mixture on clean, lightly floured countertop or you can still do this in the bowl. Sprinkle remaining flour on top of the mixture. Gently knead with your fingertips, just bringing together the mixture until flour is incorporated through. This only should take a minute or two. Any longer and you will be over-kneading. 2. Dust a clean, dry surface with a generous sprinkling of flour. Divide dough into 4 parts. Take one part and roll into a long, 1″ diameter log. Cut gnocchi into 1″ pieces. 3. 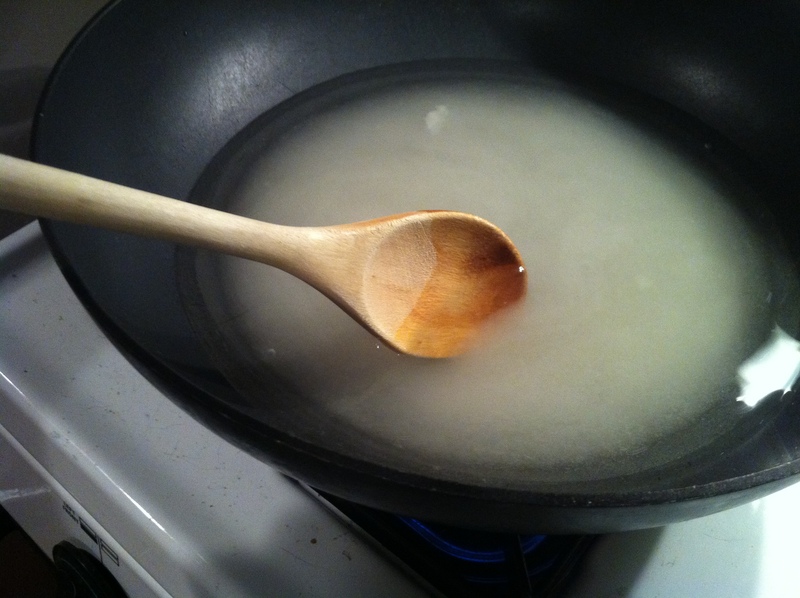 Heat a large frying pan or saute pan with just 1 tablespoon of the butter and 1 tablespoon of olive oil. When hot, add a few gnocchi – enough to cover surface but not touch each other. Fry on medium heat for 1-2 minutes, turn and fry for another 1-2 minutes. Remove gnocchi, place on large baking sheet to put into oven to keep warm. Repeat with rest of gnocchi. 4. When all gnocchi is finished, discard butter/oil in pan and clean pan with paper towel. Heat pan on medium heat and when hot, add the remaining 2 tablespoons butter and the remaining tablespoon of olive oil. When hot, add the fresh sage. Let the sage brown and sizzle (but not burn) for a couple of minutes until very fragrant. Remove the sage and discard if you want (or keep it in to eat — as many people in the comments below like to do!) To the pan, add the balsamic vinegar and whisk. Let simmer on low for 1 minute and pour over the gnocchi. 5. Serve with shaved parmegiano reggiano and a sage leaf for garnish. This recipe comes to us from the Food Wishes blog, and features small-plate gnocchi that are designed more for appetizers or sharing. I love that concept! This blog has great how-to video recipes. His step-by-step instructions for making the gnocchi are very easy to follow, so I’ve decided to share them by video. Gnocchi really is very simple to make, so I hope you are all inspired to take a stab at them now! This is another re-post recipe, because my husband and I are MOVING into our new house today! This delicious-looking recipe comes to us courtesy of eatmedelicious. Preheat the oven to 350°. 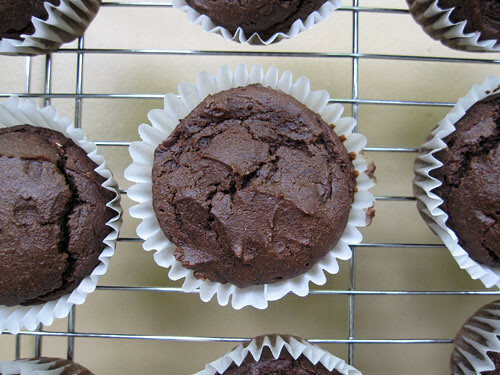 In a large bowl, whisk together the flour, cocoa powder, baking powder, baking soda, and salt. In a food processor or high powered blender such as the Vita-mix, puree the avocado, maple syrup, soymilk, oil, and vanilla extract together until smooth. 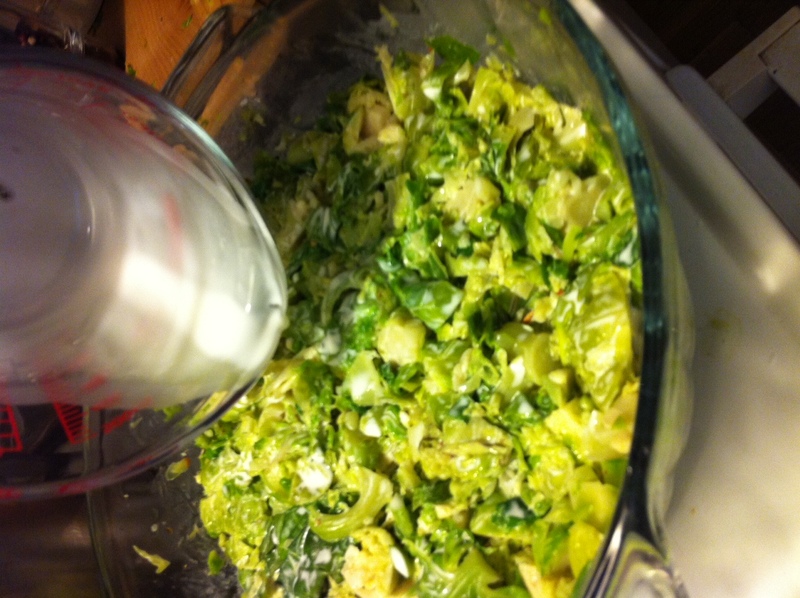 Add the avocado mixture to the dry ingredients; mix until all the flour is combined. 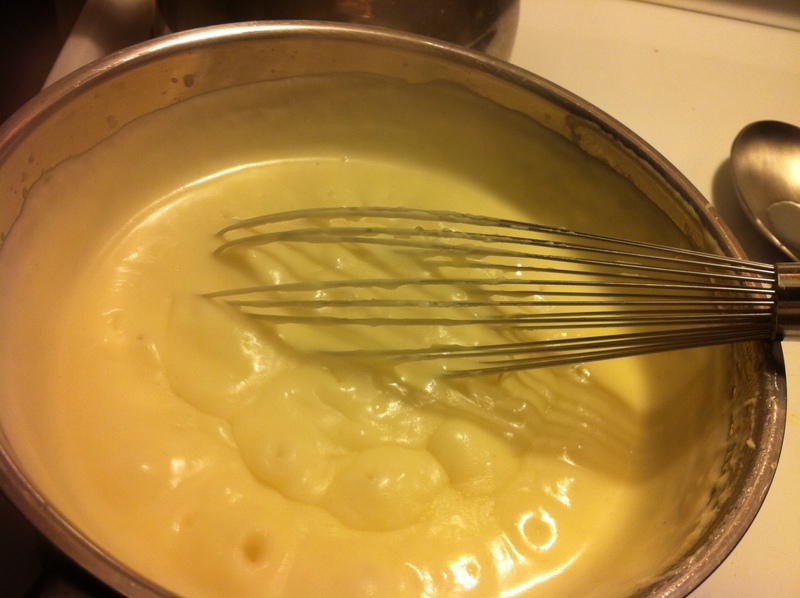 If the mixture is too dry, stir in additional milk. Fold in chocolate chips. 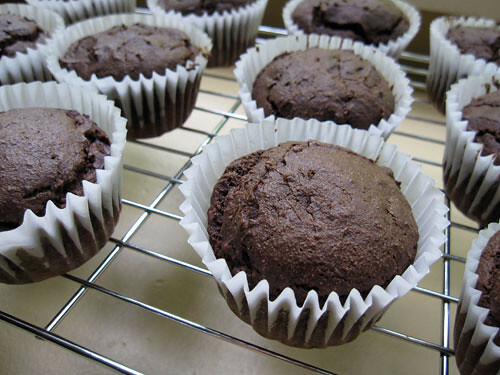 Divide the batter between 12 medium-sized muffin cups, and bake for about 22 minutes, or until a tester comes out with just a few crumbs. Let cool before unmolding. OK. Not everyone likes Brussels Sprouts. I know this. But, I’m among the rare 5% of people who LOVES them … and luckily, so is my husband! Today, I’ve got two recipes for the little green guys: Maple-Cayenne Roasted Brussels Sprouts, and a rich Brussels Sprouts Gratin. Preheat oven to 400 degrees. Line a baking sheet with aluminum foil for easy cleanup if you wish. Trim stems and outer leaves from Brussels Sprouts (about 2 pounds). Cut in half and toss on baking sheet with at least a tablespoon of Olive Oil. Season with Kosher Salt. 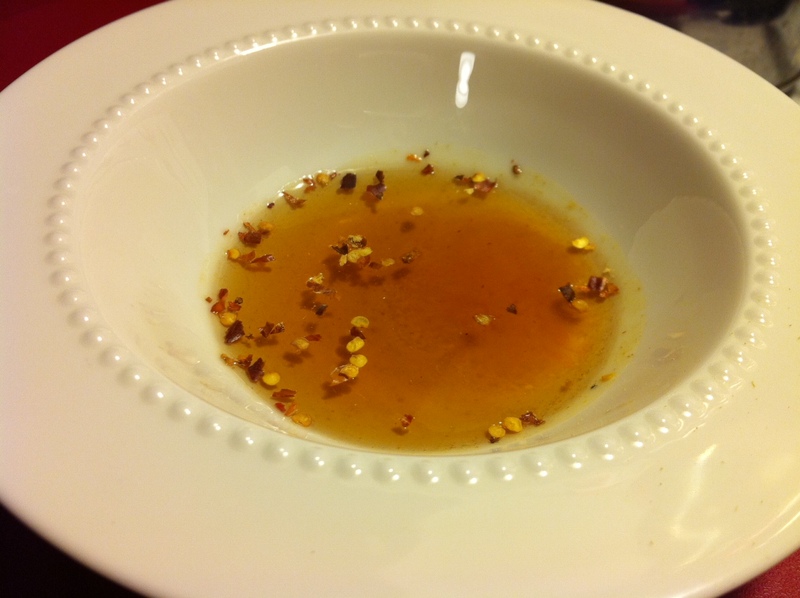 In a small bowl, mix together one tablespoon of real maple syrup and a dash of cayenne pepper. (You could also use red pepper flakes if you prefer). 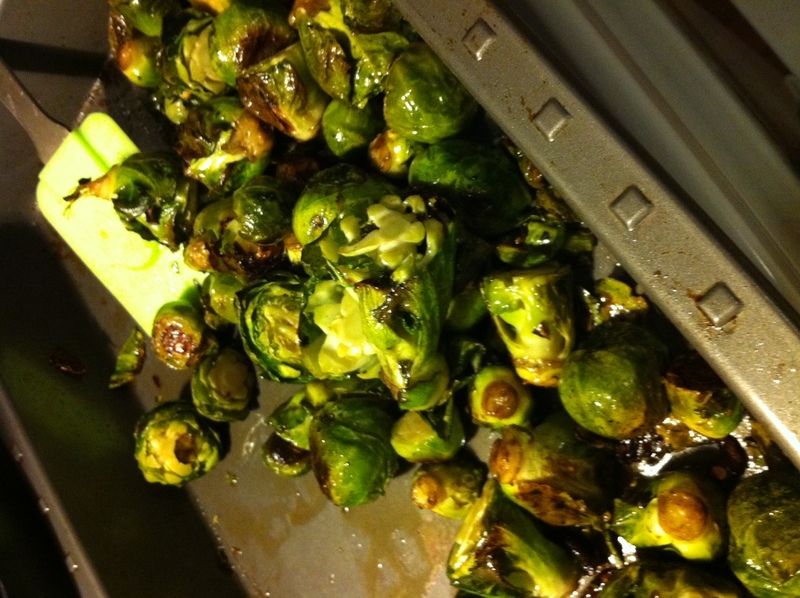 Roast the Brussels Sprouts in the oven for 15 to 20 minutes, or until tender, stirring at least once. Drizzle with maple-cayenne mixture and roast for one more minute. Remove from oven and serve warm. This really is quite rich. I feel compelled to warn anyone with acid reflux disease or lactose intolerance that they want to medicate accordingly. 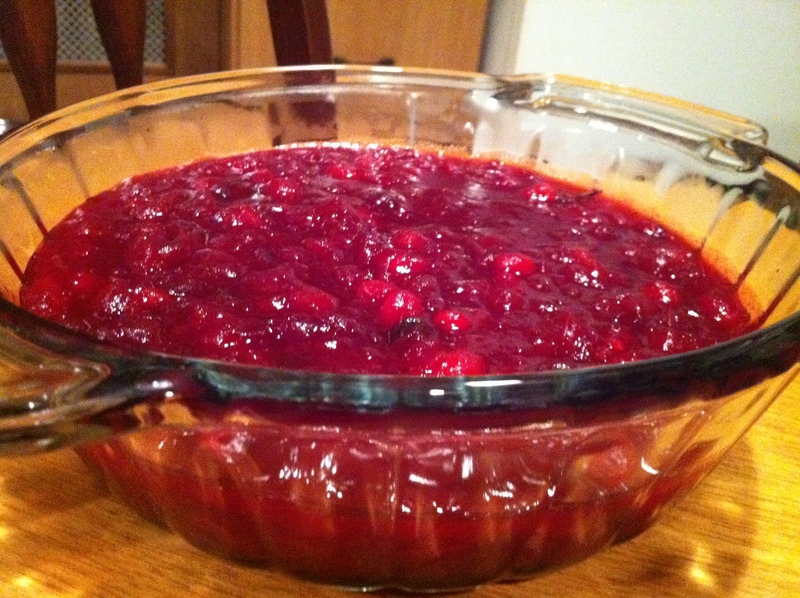 Preheat the oven to 400 degrees and butter a 2-quart glass baking dish. Bring a large pot of water to a boil. 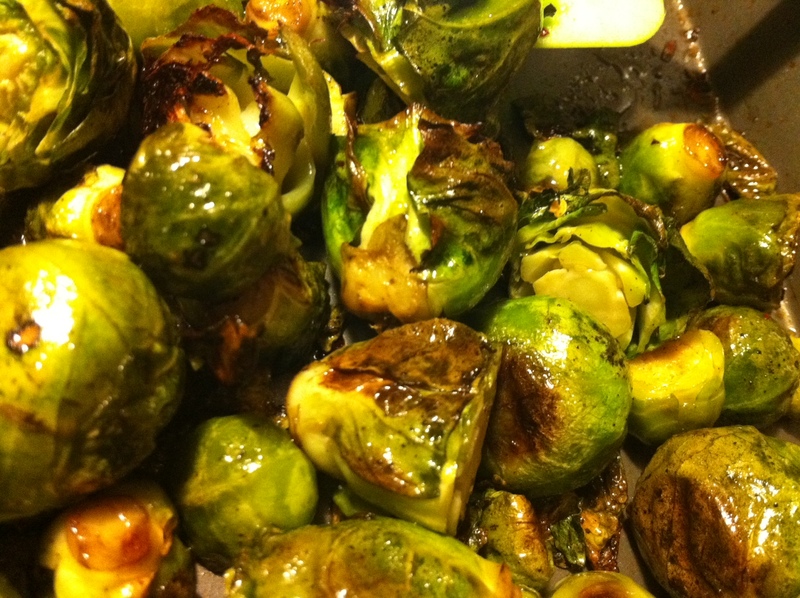 Add the Brussels Sprouts and cook until tender, about 10 minutes. 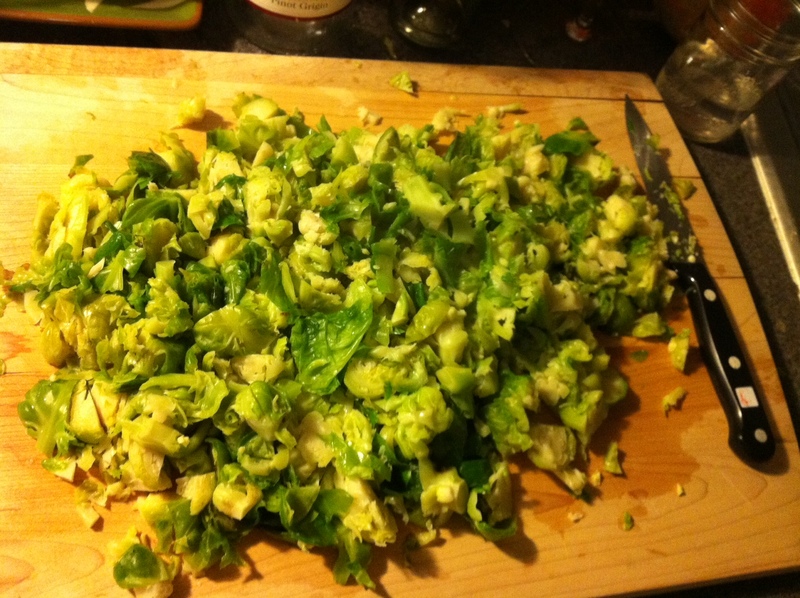 Drain the Brussels sprouts and coarsely chop. Transfer to the buttered baking dish and toss with the red pepper flakes (if you are using them), and salt and pepper to taste, then spread out evenly. Pour the cream on top. 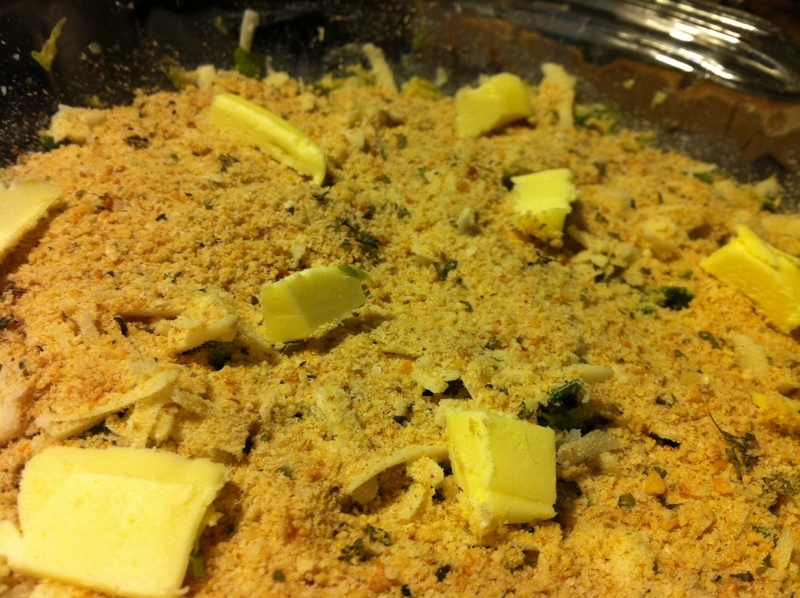 Sprinkle with the cheese and breadcrumbs and dot with the butter pieces. Bake the gratin until bubbly and golden brown, about 15 minutes. 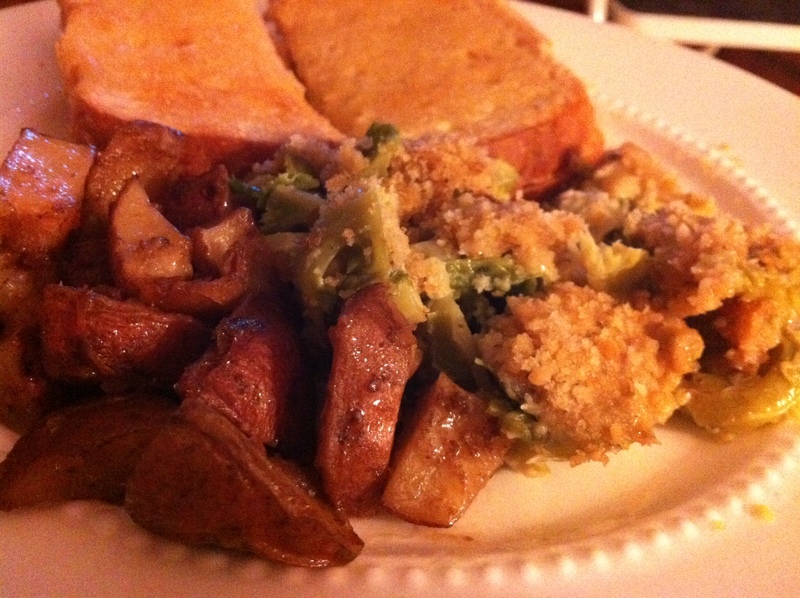 The other night when I got home from work after 9, (lots of late nights recently), the gratin rounded out a nice dinner of leftovers that also included buttered toast and roasted potatoes. My Gratin recipe was inspired by this Food Network version. There is nothing healthy about this, whatsoever. Even if you use Smart Balance butter blend sticks or soy creamer, you are still loading up on tons of carbs and artery-clogging dairy here. 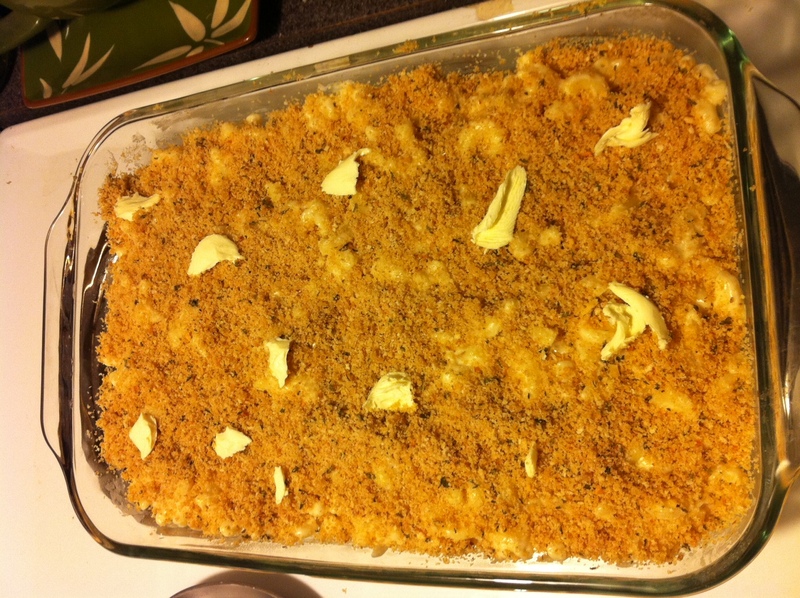 Because those are the ingredients for traditional mac n’ cheese, and that’s what I made: Full-on, comfort-food, double-the-recipe “Fat Kid” Mac n’ Cheese. Enjoy. Preheat oven to 400°F. Cook and drain macaroni according to package directions; set aside. In a large saucepan melt butter. 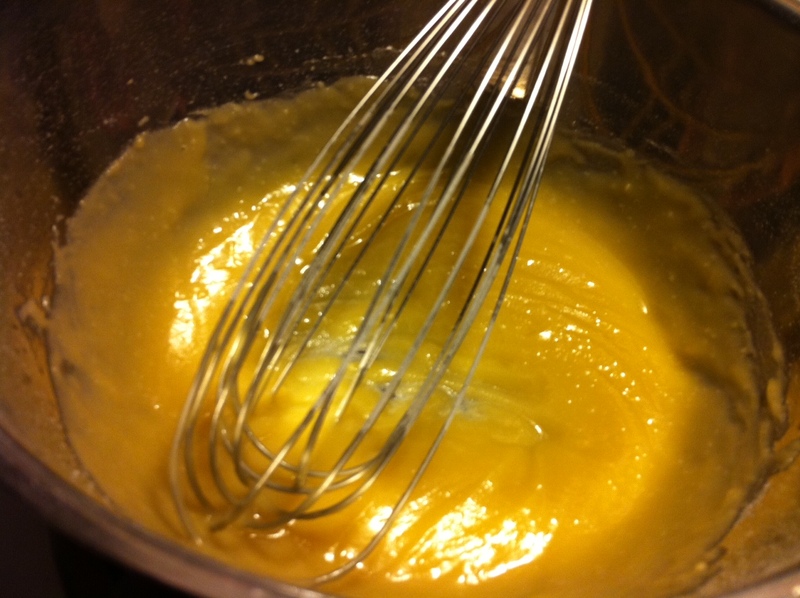 Add flour mixed with salt and pepper, using a whisk to stir until well blended. Pour milk and cream in gradually; stirring constantly. Bring to boiling point and boil 2 minutes (stirring constantly). Take care not to let it burn. Reduce heat and cook, stirring constantly, for about 10 minutes. 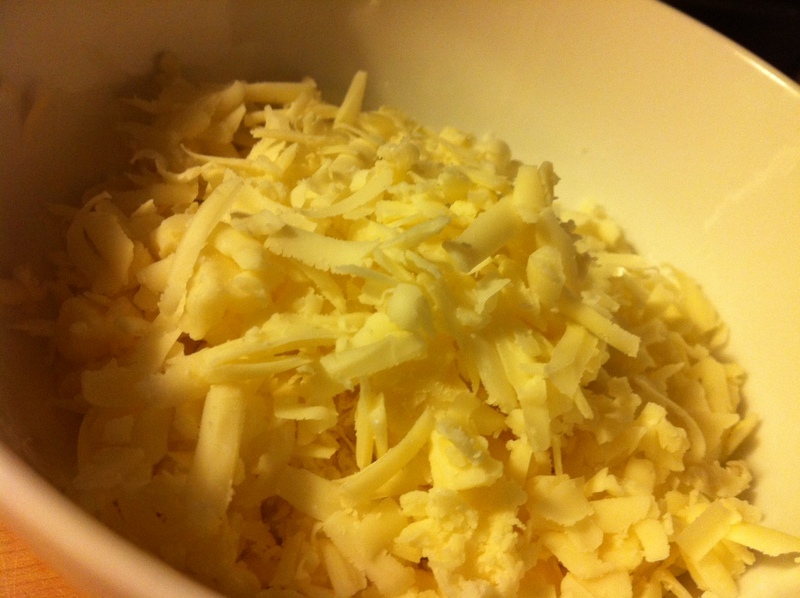 Add shredded cheese bit by bit. Simmer an additional 5 minutes, or until cheese melts. 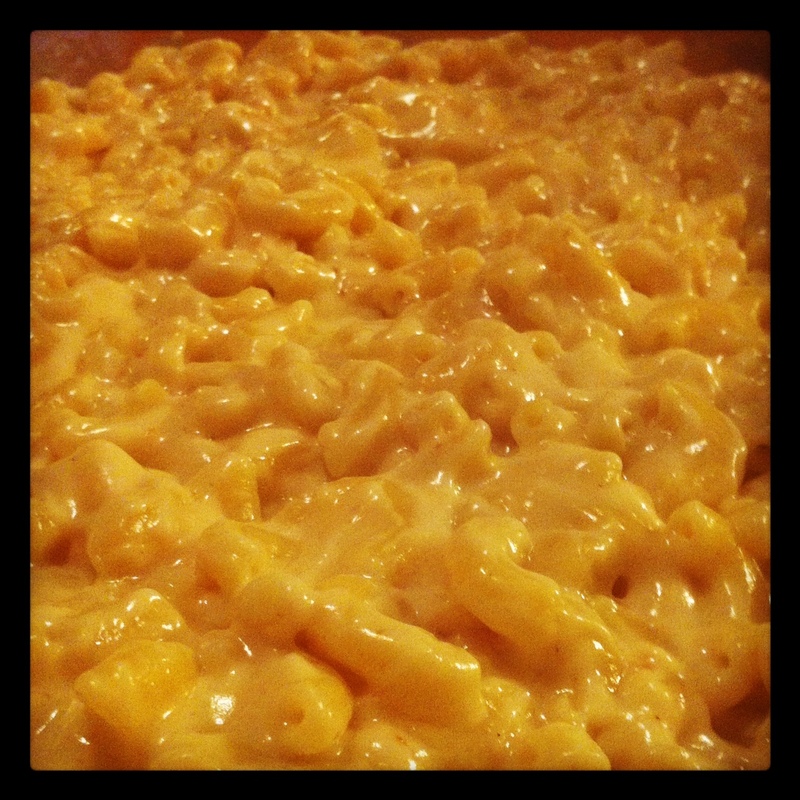 Add macaroni to the saucepan (or another bowl) and toss to coat with the cheese sauce. Transfer macaroni to a buttered baking dish. 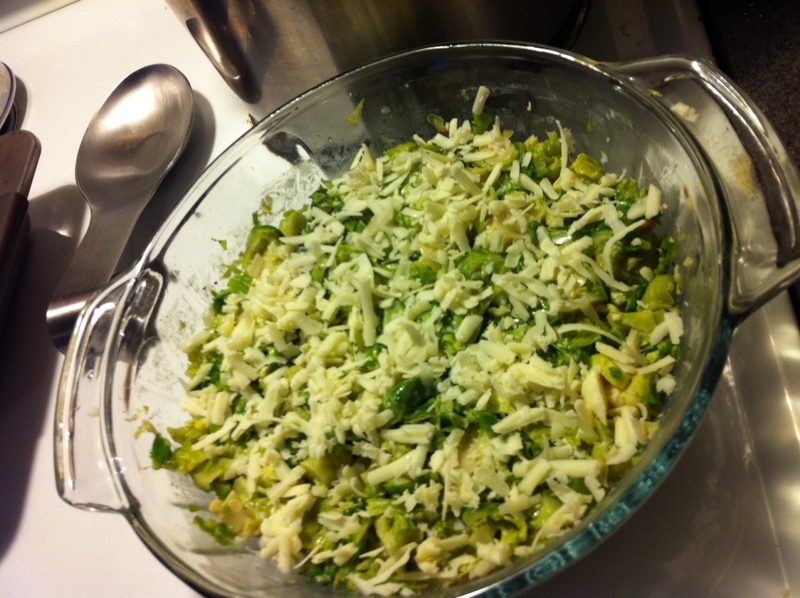 Sprinkle with breadcrumbs (I mixed mine with a bit of melted butter to moisten). Top with a few dollops of butter before putting in the oven. Bake 20 minutes until the top is golden brown. This recipe was inspired by the old favorite, Fannie Farmer’s Classic Macaroni and Cheese. Modifications: Add peas and/or carrots to the mix; halve the recipe instead of using the whole pound of macaroni; add dijon mustard and/or hot sauce to the mix for a kick; add in crispy bacon pieces if you eat meat. 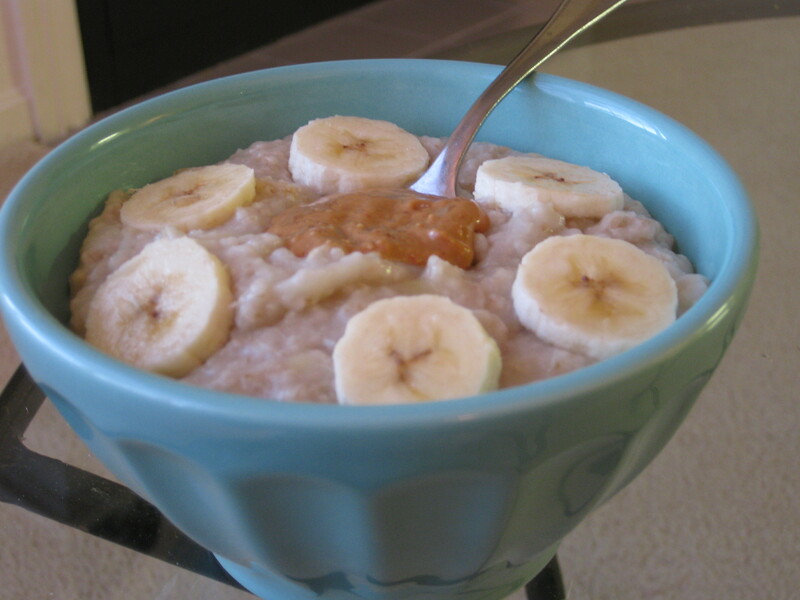 In light of my newfound house-poor status, I thought I’d post my favorite wintertime/cheapo breakfast. No more early-morning pit stops at Dunkin’ Donuts for THIS gal! This makes 2 to 3 servings, and has 4g fiber per serving, plus 7g protein. Carb count is 30g per serving for any diabetics out there. (Adapted from French Women Don’t Get Fat). Hi! 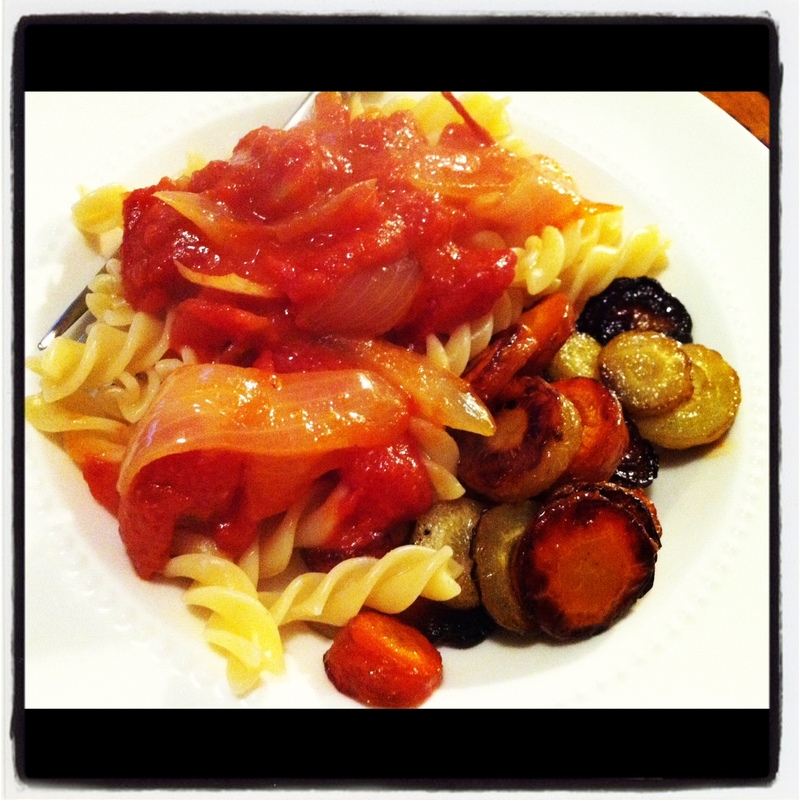 I'm a Boston-based writer and (mostly) vegetarian who loves eating, cooking and entertaining. I started this blog to develop & discover new recipes, and to share my love of all things natural and nourishing. Thanks for joining me!